Rachris World Travels: Time to say goodbye to the snail shell. 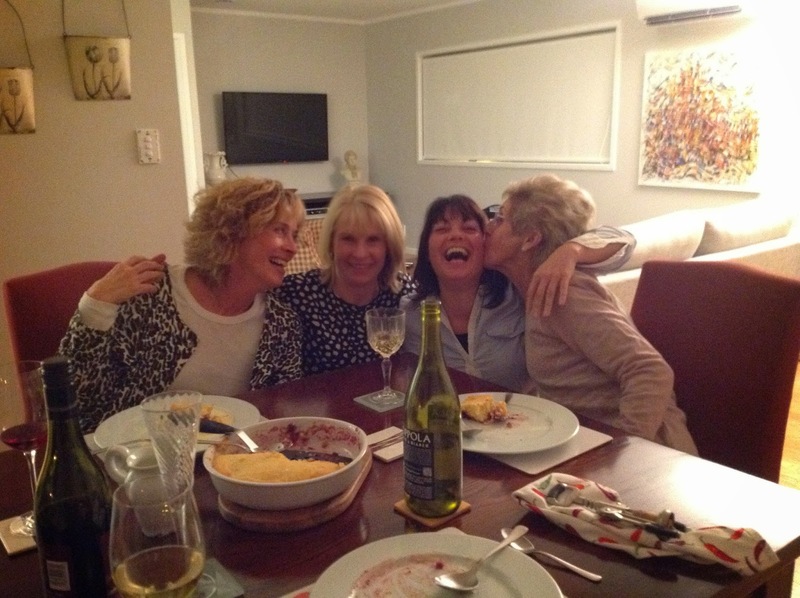 I write this whilst sitting on the bed of our host for a couple of days – Heather. We encountered her and her friend Jenny walking on New chums Beach and have taken Heather up on her offer of being her house guests for a couple of days in Auckland. More about that later. So we left skiing. Spent three days there and got one and half days skiing in. The rest of the time was torrential rain – something of a recurring theme in the North Island part of our journey. Whilst the temperatures have been generally higher than in the south it has come at the price of rain. It has lashed down on us in copious amounts, fuelled by strong winds that have buffeted us from every side. Luckily these same winds blow the clouds along so we are frequently getting all seasons in any hour. We follow a little more of the thermal route and then head off along the Forgotten World Highway. We thought we had seen all the beauty that this extraordinary country has to offer but then we have this thrown at us and once more we are oooohing our little hearts out. Great wide valleys, high sided ravines and mile after mile of folded green land stretching away to the horizon. The road twists and turns and then turns into gravel for about 20kms (It’s a Highway for goodness sake!). 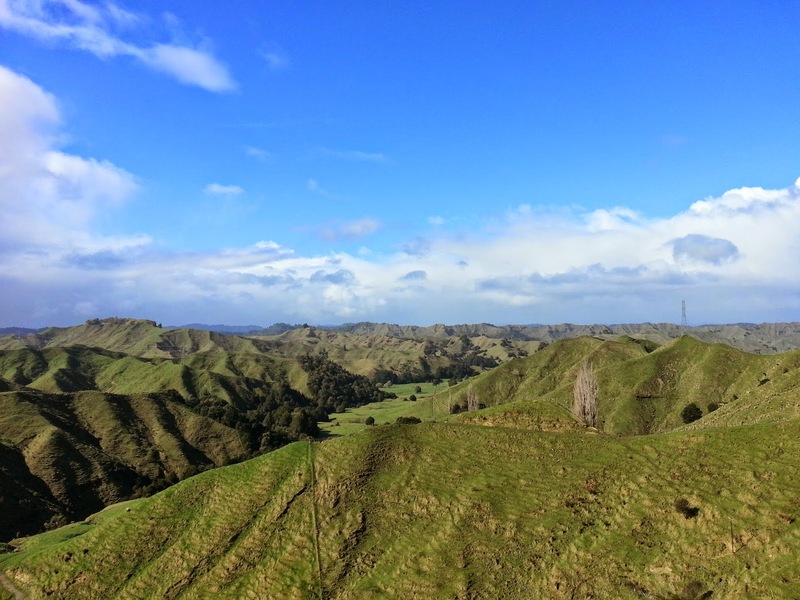 We drive through Whangamomon – Through old territorial rights this village and its surrounds made a claim that they were an independent state (Passport to Pimlico NZ style). The claims were ignored but the tiny township still advertises itself as the ‘Capital of the Republic’ and issues passports once a year to travel through the town. Further on we stay in Stratford and sleep in a rugby club car park which was wonderfully quiet and go for a snowy walk on the lower slopes of the impressive Mount Taranaki. A volcano that soars up in Fujiesque style from the surrounding flat plateau and can be seen from miles around. Its lovely drive up to the visitor centre through the surrounding woods and the walk we took along a terrific boardwalk in the cold air of a sunny day left us feeling invigorated. In New Plymouth we stayed in a campsite with our van parked on the top of a cliff looking out to sea. For a short while we even managed to get out the deck chairs and sit with a glass on NZ wine and watch the sunset. We stay her for two nights as we have more Skype interviews for jobs scheduled so wifi is needed. It’s a nice town although we barely ever spend much time looking around shops at things we neither need, can afford, or would like as momento’s. We did however venture our for a fish and chips supper with curry sauce which was bloody lovely. As you drive around NZ you repeatedly come across different policies to freedom camping. Some districts make an effort to provide quite nice areas in town and allow self-contained camping at picnic sites as long as you don’t loiter through the day. Others allow government owned car parks and amenities to be used overnight and others slap no camping signs on just about everything. It’s a little galling to see a large picturesque and unused area sitting there with not a soul in it and know that if we did stop we might be liable to a large fine. I guess we are seeing it from the side of responsible campers off season as opposed to in the summer when the roads are full of less considerate and often not self contained vans. The Waitomo glowworms are advertised as something to behold and so when we arrived we were quite ready to be underwhelmed. However, the caves were really quite extraordinary. A thirty minute walk through low limestone caverns lined with twisted, rippled white rock and interspersed with stalactites dripping lime infused water to the waiting stalagmites below. 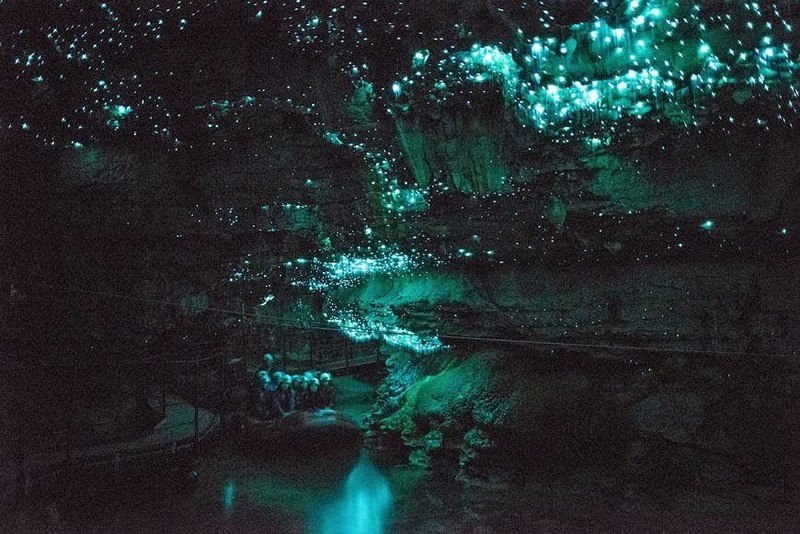 We then board a small boat and our guide, pulling us along a roped route, leads us into the water filled caves where, above our heads, are literally thousands of flickering lights of the glowworms holding to the cave roofs with their sticky silken threads hanging below. (The lights serve a purpose - flies etc. see the lights and fly towards them, prey then gets stuck on the threads below the light, thread then gets pulled up and the prey is eaten). It's all a bit gruesome but what a thing to see. Eventually we float out of the caves to land at a small jetty where the beginnings of a huge NZ night sky are await us. For our final night in the van we are camp about 50k from Auckland and I ask that my worthy co pilot Rachel find us a freedom camping location on rugged coastline with dramatic weather. Sure enough we follow a road down to wide black sand beach backed with sandstone cliffs near the town of Waiuku where we park up on a flat sandy area and take a pleasant stroll as the sun sets over the ocean. Rachel likens walking on the beach to walking on diamonds as the glinting crystals of sand reflect the light from this otherwise carpet of black. We get back to the van just as the rain starts to splatter on the ground and no sooner do we shut the door do the heavens open up and we are rocked and battered by a torrential storm all night. But every day brings something new and as we look out in the gloom of early morning, as the wind and rain still lashes the coastline we see scores of racehorses being exercised on the beach. The jockeys hunkered down as they gallop through the surf. Fabulous. Oh yeah, and a terrified baby seal is seen coming out of the ocean to be greeted by huge fast moving beasts that send him splashing back as quickly as he is able. Finally we have reached the end of our two month road trip in New Zealand. It has been an amazing experience and we have seen some stuff. To anyone coming to NZ I would urge you to set out on the roads in this manner rather than limit yourself to towns and daytrips. It is a remarkable country and to immerse yourself in its wildness, even to the limited amount we did, is a fabulous thing. Two months, however, In a very limed space in winter is enough for anyone. Even loved up fools like us who revel in each other’s company feel it is time to move on. We return the van and once again are impressed with how mighty/kea/maui rentals treat us. Refunding money we spent on a gas bottle and waiving the original charges of gas bottles as well because there was not enough to last our journey. And so here we are at Heather’s house. Slightly jaded after a great dinner party last night with Jen and Heather's friend Lynne which felt like passing time with old friends. 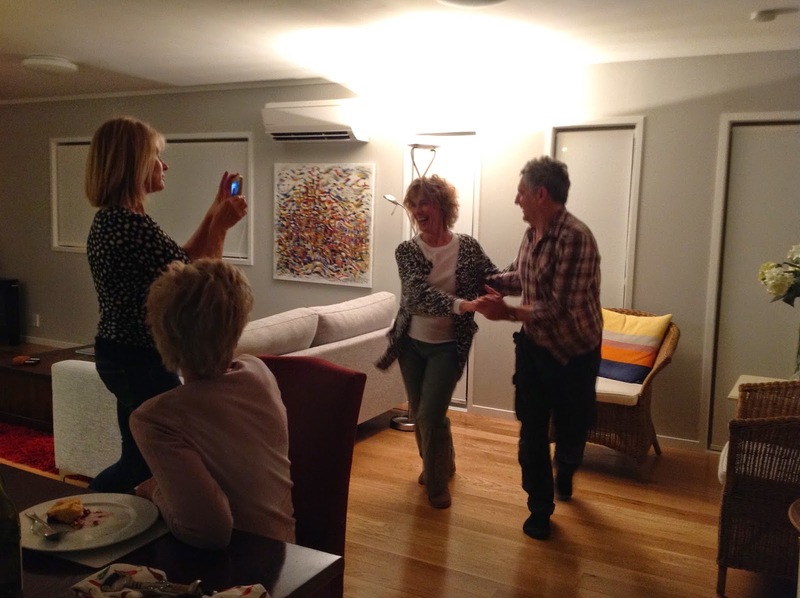 We ate a fabulous meal of roast lamb, vegetables with a plum dessert as the wine flowed, taste tests were conducted, dancing and yoga exhibitions were given and laughter prevailed. Today our host gave us a tour of Auckland where we ate at the trendy waterfront, envied huge boats in the bay and took a view from the top of Mount Eden - one of 50's volcanos in and around the city. Brilliant! So thank you New Zealand for two marvellous months where Rachel and I feel immensely grateful to being alive. So your NZ adventure has come to an end I have to say it looks absolutely picturesque, what a lovely experience for you both. Oh well I suppose you are going to have to go off to Tonga, oh well.. grin and bear it. Have a great time and we will speak soon by the way good luck on the interviews.